It was the day of preparation, and the Jewish leaders didn't want the bodies hanging [on the crosses] the next day, which was the Sabbath ... So the soldiers came and broke the legs of the two men crucified with Jesus. But when they came to Jesus, they saw that he was already dead, so they didn't break his legs. 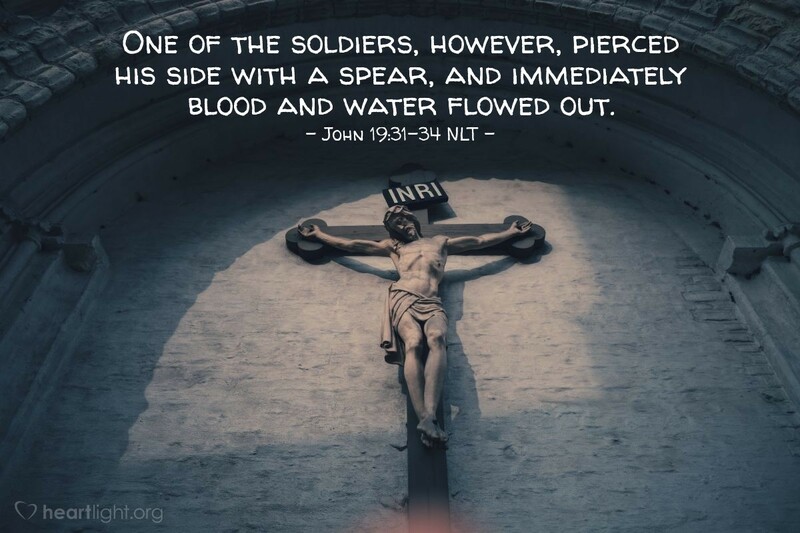 One of the soldiers, however, pierced his side with a spear, and immediately blood and water flowed out. John, the writer of the Gospel of John, was a witness to this death of sacrifice and love that bought our redemption (John 19:35). He wants us to realize that we are witnesses, too. When we share in baptism and in the Lord's Supper, the abiding presence of the Holy Spirit helps the Savior's loving death come alive in us. Jesus, the Son of God, died for our sins so that we can live with him. Blood and water provide that ultimate sign of death and sacrifice. Through grace, we are invited to share in Jesus' death and sacrifice and to be saved by him! We then become witnesses to their power in our lives. Almighty God, how could you do this for me — how could you hold back your power and let your Son die for my sins and the sins of all of us sinners? As the old hymn says, dear Father, "Love so amazing, so divine, demands my soul, my life, my all." Thank you, in Jesus' name and because of his sacrifice. Amen.